If you're still in high school and you're interested in enrolling in Army ROTC, you can find schools that carry an Army ROTC program or talk to your academic advisor. Learn more about Army ROTC scholarships for high school students. If you're interested in enrolling in Army ROTC and you are in college, you can start by taking an Army ROTC basic elective course. If you have at least two or more years remaining toward your undergraduate degree, but not enough time to complete the Basic Course, you can enter the Army ROTC Advanced Course by completing Basic Camp held at Fort Knox, Kentucky, during the summer. Talk to the Admissions and Scholarship Officer about other ways to enroll in Army ROTC and the incentives available, including opportunities to compete for two-, three-, or four-year scholarships. If you have two years remaining in junior college or graduate school, you are still eligible to enroll in Army ROTC. This course is for those college students who want to complete Army ROTC training in two years. To qualify, you must complete a challenging and motivating 28-day training program at Fort Knox, Kentucky. Upon completion of the Basic Camp, graduates return to campus prepared to enter the Advanced Course. Contact the Admissions and Scholarship Officer for more information. If you are an Enlisted Soldier in the Army and interested in becoming an Officer, find out more about opportunities for Soldiers. Learn more about Army ROTC scholarships for Enlisted Soldiers. Contact the Admissions and Scholarship Officer for more information. The Simultaneous Membership Program allows you to attend Army ROTC and serve in the U.S. Army Reserve or Army National Guard at the same time. It gives you an opportunity for additional training and experience. Cadets serve as Officer trainees in the Reserve or National Guard while completing college. You can earn Reserve/Guard pay and benefits in addition to your Army ROTC allowances. In addition, you must be a sophomore or higher to be eligible for SMP. Contact the Admissions and Scholarship Officer for more information. The four-year program is ideal for incoming college freshmen. A student will take Army 101 and 102 their freshman year, sophomore year will be Army 201 and 202, Junior year Army 301 and 302 and Senior year Army 401 and 402. Advanced Camp will usually take place in the summer between the Junior and Senior years. The three-year plan is for a college student who has three years remaining in their degree plan for graduation. This student will have to take Army 101 AND 201 in the Fall semester and Army 102 AND 202 in the Spring Semester inorder to fulfill ROTC commissioning requirements by the time they graduate. A student on a two year plan must have prior-service in the military, or have successfully completed Basic Camp in order to be accepted into the Army 301 course. Contact the Admissions and Scholarship Officer for more information. 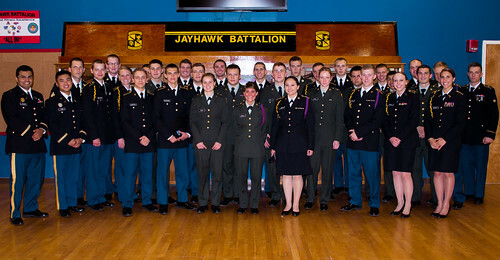 Army ROTC students who receive an Army ROTC scholarship or enter the Army ROTC Advanced Course incur an eight-year period of service with the Army. You can serve full time in the Army for three years (four years for scholarship winners), with the remaining years in the Individual Ready Reserve (IRR). It's an experience that you can't get anywhere else, and your leadership skills will be challenged every day. Contact the Admissions and Scholarship Officer for more specific details on your Army ROTC service commitment. Enrolling in the Army ROTC Basic Course does NOT involve a commitment of service to the Army unless you have received an Army ROTC scholarship. Non-scholarship graduates may serve three years on Active Duty and five years in the Inactive Ready Reserve (IRR). Army ROTC prepares college students to succeed in any competitive environment. The leadership training and experiences that students have in Army ROTC will provide them with a foundation to become commissioned Army Officers upon graduation. Upon completion of the Army ROTC program, graduates will be commissioned as Second Lieutenants in the U.S. Army and will embark on specialized training in their first Army branch. Upon completion of Officer branch training and a first assignment, Army Officers may pursue additional specialized training and postgraduate education opportunities. They will be assigned to advanced leadership positions and to staff positions in upper management. Also, they may develop doctrine, teach military tactics or serve as advisors. Cadets may also elect to commission into the Army Reserve or Army National Guard. Availability of positions vary within each unit. Within this section are links to more detailed explanations on this site. This information will offer you more practical advice to give your loved ones the information to enroll or apply for scholarships.